Warwick Innovation Centre and Laura Underwood, commercial manager at Fertility Focus. A game-changing fertility tracker which increases women’s chances of becoming pregnant has been developed in Warwick. 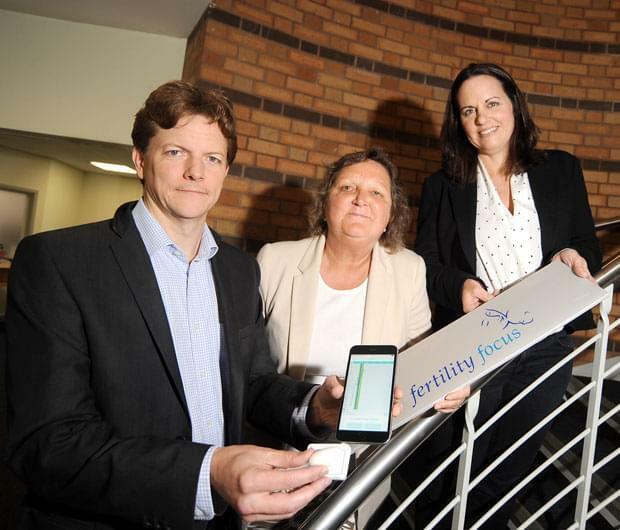 Fertility Focus, based at the University of Warwick Science Park’s Warwick Innovation Centre, in Gallows Hill, has launched a brand new app version of its real-time OvuSense fertility monitor. An internal device is used to accurately measure core body temperature and relays the data back to the app which gives an accurate indication of fertility to its users. The original version featured a sensor device and a separate monitor, however the new version links the device to an app, making it cheaper and the data more accessible. Rob Milnes, CEO of Fertility Focus, said: “Our new app means that users can get daily updates on their fertility status, a prediction of when they will be ovulating as well as confirmation of when they are ovulating straight to their mobile phones. “The app was developed with funding from a number of investors which began investing in the company in 2010. “The updated version has replaced the need for a separate monitor which has not only brought down the cost for users but also means people can access their personal data anywhere. The internal device, which is worn overnight and takes temperature readings every five minutes, not only increases the chance of becoming pregnant but also develops each user’s knowledge on their fertility. Fertility Focus has received funding from a number of backers, including investors supplied by Minerva, one of the business support programmes offered by the University of Warwick Science Park. Due to the company’s success, it is currently in the process of moving to a larger office at the science park and is taking on more staff. Karen Aston, centre manager at the Warwick Innovation Centre, said: “This is a very exciting development which could benefit countless women who are struggling to conceive.